Every family has its hidden struggles. The Hoemke family is no different. 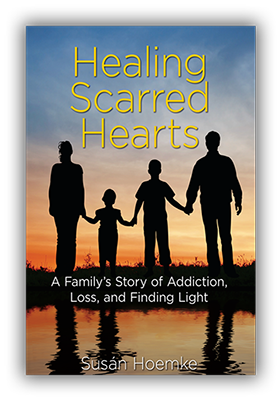 Devoted mother and author Susán Hoemke bravely shares their devastating journey through crippling addiction and loss in Healing Scarred Hearts: A Family’s Story of Addiction, Loss, and Finding Light. Hayden Hoemke, the oldest of four beautiful children, began experimenting with and abusing substances at a young age, which led to his opioid addiction. For eight years, not only did he hurt himself but his family agonized as they tried desperately to seek help for him. 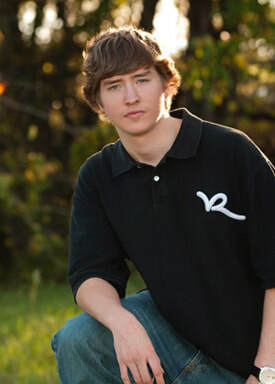 At the young age of twenty-two Hayden died tragically due to an overdose, and the family was forever changed. Through Healing Scarred Hearts, Susán unflinchingly relates how the mental and physical impact of the drugs on Hayden’s body turned her happy, creative son into a stranger in their home. Her first-hand perspective on the unthinkable pain of losing a child and the fight to rebuild her family serves as a wake-up call about the sweeping opioid epidemic. Emotional, raw, and gripping, this memoir provides a resource of hope and help to other families. "As a founding Principal of the longest operating recovery high school and LCDC who has counseled hundreds of families with substance abuse and addiction issues, I feel 'Healing Scarred Hearts' is a must read for families, counselors and persons in the justice system working with young adults. The book personalizes the issues, gives vivid descriptions of the pain and problems the family encounters while giving hope for change as help is available!" "This is a story of courage, unwavering parental love, and extraordinary spousal support. It is told without shame, so anyone who may be hiding addiction—either one’s own or that of a loved one—may feel safe, unburdened by judgment, and can reach out for help." Has the writing experience been positive? Why or why not? I have been able to heal through writing because it has been therapeutic for me. It was hard, however, because in order to get our story from my mind to paper, I had to relive those hard eight years in my head. It took many tears and a lot of tissue, but I began to notice the great release of pain and the ability to let go of the shame when writing. As time passed, I began to feel a sense of urgency to educate others and share everything we had experienced to hope- fully take away the shame and pain others might be living with—or might not even know is possibly coming. Writing our story has been a positive experience for me, thanks to the love and support from my husband and family. How has sharing your story helped you? In what ways do you hope it will help others? Being able to share our story has given me a chance to soften my heart after losing my son. Through mourning, dealing with the pain, and talking about it, I can now enjoy the wonderful memories I have of him, like the joy and laughter he brought to the family. I wrote the book to not only bring about awareness, education, and more discussion about addiction, but to also bring hope and healing to those living in tough situations or who have lost someone to addiction. What related organizations are you involved in, and what do they mean to you and others? How can readers get involved in these organizations? When looking for support, AA (Alcoholics Anonymous) or NA (Narcotics Anonymous) or Al-Anon meetings can be very helpful and are usually found in most cities. There are many groups, such as Winning the Fight and Hope Sheds Light, dedicated to supporting families and having information on their websites. I have been involved with local school counselors to build better drug awareness in our district and speak to parents in hopes of bringing about a better understanding of drug prevention and drug awareness. It will take all of us to reverse the overdose epidemic. As a boy, Hayden enjoyed family, friends, and meeting new people. He was full of humor and wit and therefore had a great ability to bring laughter to an entire room. An A student through eighth grade, Hayden’s creativity always made his work unique and interesting when he was assigned a project. He also had a special passion for music and a gift for lyricism. Before his death, he attended the Art Institute of Dallas in the hope of earning his degree in audio engineering. Hayden is missed by the many people who love him. The knowledge that Hayden is resting peacefully now in God’s care brings comfort to his family and friends, who all look forward to seeing him again someday. He is gone but never forgotten.